Andrew Foxwell runs social advisory firm Foxwell Digital with his wife Gracie, where they specifically run Facebook and Instagram Ads for their clients. In total, they can be managing up to $500,000 of advertising for their clients per month. In fact, he considers himself one of the Grandfathers of Facebook Ads, having been doing it for over eight years full time. He started whilst working in the US Congress as a Press Secretary running Facebook Ads, working with members of Congress through the Government communications agency. From there, he went to work for PCC Associates (Now 3Q Digital) running the direct response social paid ads for GoPro and FitBit in the early days. This was back when Facebook Ads consisted of boxes on the right-hand side asking for page likes. The newsfeed ads we’re used to today came out in 2012 around the same time as he co-founded his own agency. Having tried it all, Andrew is one of the leading voices you should be listening to when it comes to learning how to successful run your own Facebook Ad campaigns. Andrew had always felt he wanted to work in Government, as well as owning his own business. And despite that, it still amuses him that he has to travel across the country to meet with clients. It’s a big step up from growing up on a farm, and it leaves him feeling quite fancy. But what he does now is as a result of his fascination with computers during the 90s. He still likes to think what he does as carrying out his own version of farming. He is waking up in the morning and optimizing Facebook Ads, and building new ones, thanks to his mid-west work ethic. During his time working in Government, he learned some valuable lessons which influence what he does in business today. If you want to be taken serious, then you have to act seriously. And by doing this whilst working in Government, he was taken seriously despite only being 23 years old. It is also worth being transparent at all points, and to couple it with empathy because what can happen is incredible. So be honest if you don’t know something because there is going to be someone who is happy to explain it to you. Think of it as a learning opportunity rather than admitting failure. He learned a lesson in personal branding too and letting people know who you are. For him, it was as simple as answering the phone saying ‘Foxwell’. At the time, it wasn’t intentional and just thought it sounded cool, but the reality is that people could recognize him instantly. People are still shocked to hear that at Foxwell Digital, they don’t post on Facebook or Twitter. They focus on paid social media rather than creating organic content. Their goal is to help clients spend their dollars most effectively to achieve their Key Performance Indicators. In most cases, that consists of advertising the product or service in order to make money. But when it comes to marketing, and particularly in social, there is a growing number of people who are niche specialists rather than generalists. And that is a good thing. Andrew believes that if you focus on one thing, and do it well, you will be better at it. And it is now not uncommon for companies to hire individuals to specifically handle one piece of the overall puzzle. With paid social, he also finds it is easier to prove the ROI because what they do is designed to achieve that one thing, which it either does or does not do. Compared to generally creating social content, it is hard to prove it is being effective. But this can be coupled with social paid to the benefit of both. When it comes to small business, you have to start investing time and energy into thinking about social paid and how you’re going to use it. What that means is that you’ll end up spending less time on producing and posting organic content. Andrew argues that it is easier as you don’t feel the need to be posting something every day, and can instead post just a few things in a week and then spend $10 on the ads. That is especially the case once you’ve learned enough about ad targeting to know what matters and will drive it. You can then decide what you’re going to measure to truly prove whether or not what you’re doing works. Compared to other social media outlets, he finds that with Facebook and Instagram, you get a higher volume and a more consistent number of people. LinkedIn and Twitter are the next best, but not as reliable because they don’t have the same volume nor the same level of sophistication in the ad. And likewise, Facebook Ads and Google Ads are not the same. The core difference it that Google uses demand capture, meaning you’re targeting people just as they’re showing an intent to purchase, and therefore have a smaller window. On social media, it is demand generation. You’re not driving a short-term purchase, but over time are convincing them that they actually need the thing you’re informing them of. And that means you’re showing both groups of people different things. If you’ve never run Facebook Ads before, then there are two things which you should do before getting started. The first is to go Facebook Ad Manager. Once there, go to the sub-menu on the upper left corner and click Audience. Within there, you can create and save target audiences. You have the freedom to play around and see what it is possible with Facebook Ads before spending any money. You’re just simply checking out what audiences are out there for you to target. Second is to look at the Facebook Adverts Guide. It is a place which shows you every single type of Facebook Ad that exists, showing a mock-up of how they look when displayed. It shows you what is available for different objectives, whether it be driving clicks, conversions, or promoting posts. Once you’ve selected your intention for it, Facebook will then show that ad to the people are most likely to carry out the action you’re after. It is automatically optimized and makes it cost effective. So you first have to define what you want to do and the goals you think are realistically possible. Next, you figure out those audiences and find out what creatives you have at your disposal to use (videos and images). But if you’re not having success with the people you’re targeting with them not taking the specific action you’re after, then it is worth rethinking the strategy and looking at alternative objectives. What can you do to create a more effective program? When you’re looking to target brand new traffic that hasn’t been to your website before, the most effective audience you can create is a lookalike audience. This is the ability to take the email address of a previous customer, or a fan of your Facebook page, and to then find a list of people who are similar based on over 2,000 factors of similarity. That is something which only you can use, to create an audience which is unique for you, based on the factors which you find important. Website custom audiences are being able to retarget people who have previously visited your website, or have even taken a specific action whilst on it. And using behavioral targets, using data which Facebook leases from data vendors across the world such as credit card transactions, it will help you to target people according to consumer behavior. But even when you don’t have a profit which comes from Facebook straight away, you can still use it as a market research tool. You can test age segments and whether the ad appears on the app, mobile, or desktop version of Facebook or Instagram. And there are a lot of other multi-variant testing factors available too, helping you to see which groups of people prefer to see your ad, and the types of devices they prefer to see it on. At the start, Andrew likes to keep the constant of the test as the content, keeping it open as to who he wants to target, for example by geographic location. Over time, he can control the target audience to the people who are cost effective to acquire and can then begin testing the message which is shown to them. To find out more about what Foxwell Digital, and to read testimonials and catch up on what they’re up to, then make sure you visit the website. 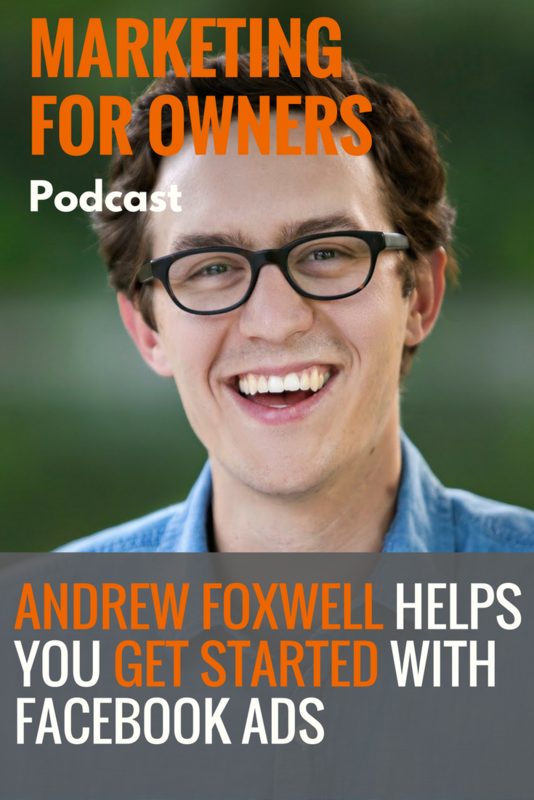 Feel free to also email Andrew with any questions you may have regarding Facebook and Instagram advertising by dropping a message to andrew@foxwelldigital.com.